»Keep on Smoking«. 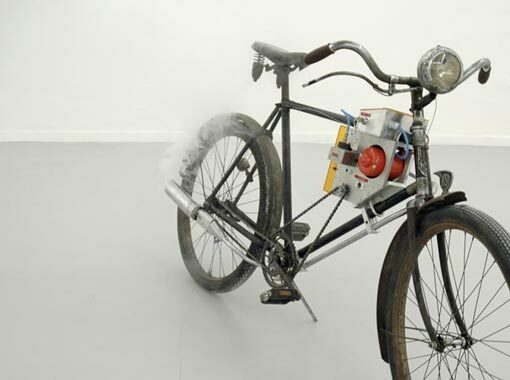 As an alternative to petrol, this custom-made bicycle transforms kinetic energy produced by the cyclist into smoke. Video. »Shared Propulsion Car«. 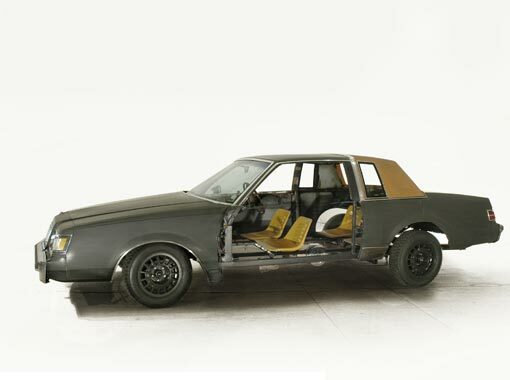 In this project, all superfluous devices were removed from an 86’ Buick Regal (such as the motor, suspension, transmission and electrical system) thereby reducing the weight of the vehicle whilst preserving its appearance. It was then equipped with 4 independent pedal and gear mechanisms that make it possible for passengers to form a self-propulsion group. The »Shared Propulsion Car« makes it possible for the passengers to drive on public roads with the goal of blocking traffic. »Réparations«. This work is an initiative in the course of which used plastic bottles found by chance on the street are recuperated and transformed into rockets. The ballistic launching device is made up of a bicycle pump used to compress a mixture of water and air in the recuperated bottle. Through the incessant up-and-down movement of the pump, the internal pressure reaches its peak, which results in a loud explosion and the release of the bottle’s compressed contents. In this way, the bottle is transformed into a veritable rocket and shoots skyward. In walking through the city, bottles that had been abandoned in the streets were successively fired into the Paris sky. All projects by Michel de Broin.